Stovetop Pots, Pans and Cookware - What Should I Buy? You are here: Home / How To / Pots, Pans and Cookware – What Should I Buy? I often have readers ask me to write about the types of stovetop cookware I recommend, particularly for a home cook who is just starting out. If you’ve ever been shopping for pots and pans, you know it can be a perplexing process. It’s easy to get confused with the dizzying amount of cookware choices on the market. While the simple choice might be to get one complete set of cookware and be done with it, this isn’t always the right (or most economical) choice for a serious home cook. Certain pans have strengths and weaknesses, and you may not need an entire set of pans when you consider your own cooking needs. On the flip side, if you’re a busy home cook, a simple cookware set may not be enough to stock your kitchen arsenal. It can be difficult, especially if you’re purchasing your first set of cookware, to know exactly what you need. 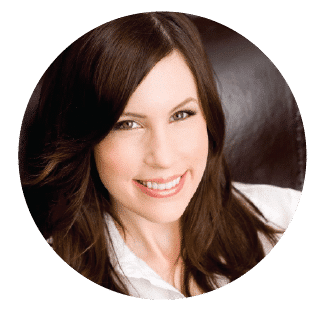 I feel the best way to approach this is to give you a comprehensive overview of the major types of stovetop pots and pans out there, along with their potential uses, to help make the decision process a bit easier. Evaluate your own cooking habits– do you do a lot of frying, or are stews more your thing? Do you like roasting chickens? Is easy cleanup important? 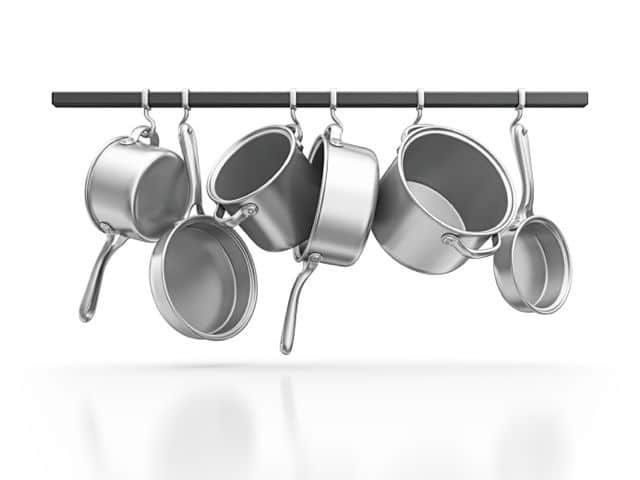 Once you are clear on the types of cooking you do most, it will be easier to figure out which pots and pans you’ll need in order to get comfortable in your kitchen. First, it’s important to understand the different metals and surfaces that pans are made from and how they can affect what you are cooking. The thickness of the metal is important, as pans with a thicker bottom will heat more evenly. Different kinds of metal have different conductivity– in other words, the speed that heat is dispersed through the pan and to your food. 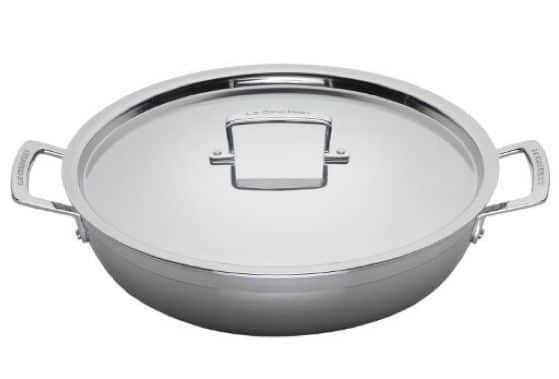 Aluminum pans conduct heat well and are lightweight, making them easy to lift and handle. You should not store food, particularly those high in acid (tomatoes, lemon juice) in aluminum, because the chemical reaction will cause a change in both color and flavor. Stainless steel pans are nice, but unfortunately are not the greatest for creating even heat. They are best for cooking at low temps or for holding steaming baskets, when even heat is not as crucial. Many nice pans are made from stainless steel, so when using them, be sure to keep an eye on what you’re cooking so that it doesn’t burn or scorch. Non-stick coatings on pans are great for cooking low-fat meals because they do not require any added oils. Certain non-stick surfaces may be healthier to use than others (I’ll expand on this below). Be careful not to use any metal utensils or rough sponges on non-stick pans because the coating scratches very easily. Copper, though it is rarely used now, conducts heat better than any of the other metal used for cooking equipment. It is very expensive, heavy and requires a good amount of maintenance. It also chemically reacts with some foods, creating a poisonous compound, which explains why you now see pans with a copper core that is lined with another metal, like stainless steel, instead of pans made from pure copper alone. While copper pans do exist, they are quite pricey and should only be used by cooks who know the benefits and weaknesses of cooking with copper. Now that you know what you’re getting into in terms of metal, let’s take a look at the many varieties of pots and pans out there. I’ve also linked out to some solid options for each cookware variety below, in case you’re in the market for some quality pots and pans. 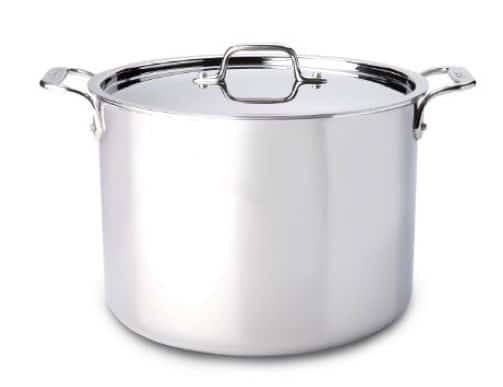 A stockpot is a very deep pot with high, straight sides and two handles. They are best for heating and simmering stocks (broths) or any other large quantity of liquid. You can also use them for blanching vegetables and canning. A saucepot is similar to a stockpot, but shallower in depth. The shorter sides make it easier to stir soups and sauces. 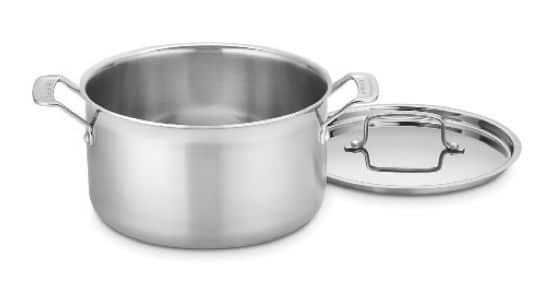 Braisers, like stockpots and saucepots, have straight sides, but are shorter in depth. They are great for browning and braising meat, cooking stews and reducing larger amounts of liquid. They can be used in the stovetop and in the oven. Saucepans are one of the most universal pan choices. Lighter and more shallow than the saucepot, they typically have one long handle and straight or slightly slanted sides. They can be used for cooking a wide variety of food on the stovetop, including, but not limited to: soup, pasta, rice, oatmeal, boiling eggs, and making popcorn. It is nice to have a few saucepans in your kitchen; they are user friendly and can cook a wide variety of foods. Sauté pans are shallow pans with one long handle. They come with either straight sides or sloped sides. Each has a different purpose. 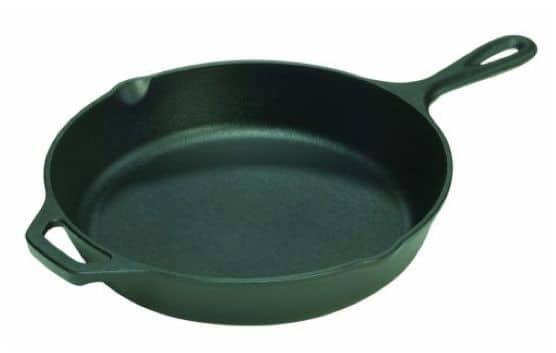 Straight-sided sauté pans are used in sautéing, browning and frying. Their large surface area lends well to reducing liquids quickly and the straight sides help to keep the liquid from splashing out. 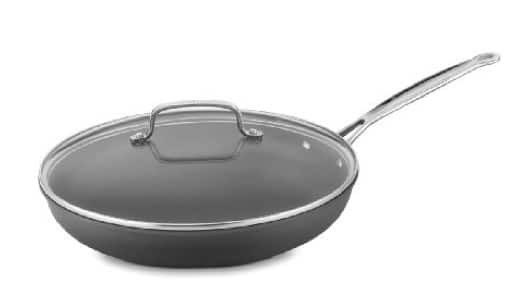 Slope-sided sauté pans, also called frying pans, are another universal pan. They can be used to sauté or fry meat, eggs, vegetables or roast nuts for a salad. 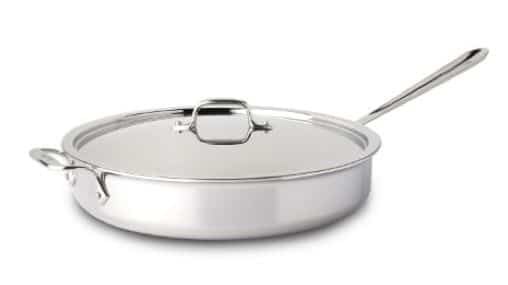 If you’re skilled in the kitchen, this type of sauté pan is best for flipping food, like pancakes, without using a spatula. I prefer frying pans with a nonstick coating, however some nonstick surfaces contain a chemical substance called PFOA. Even though PFOA is considered food safe, I have read a lot about it and have decided that I do not want these chemicals ending up in my food. All of my frying pans are made by Scanpan, (see the splurge links below). They are completely nontoxic, PFOA-free, and very well made, but they are an investment. There is technically nothing wrong with a normal nonstick pan, but I try to keep my kitchen as clean and natural as possible– so in this category, if you’re going for a nonstick surface, I suggest splurging on a Scanpan or another PFOA-free nonstick pan if you can afford it. I have not suggested a bargain here because I don’t currently stock one in my market, but if I come across one I will definitely add it. Cast-iron or enameled cast iron skillets, as mentioned above, are very heavy and hold a nice even heat. They are great for frying. They also have some other interesting and unexpected uses, like baking cornbread or pineapple upside down cake, as they can be used on the stovetop or in the oven. Basic cast-iron is best for cooking things with only a small amount of liquid, while enameled cast iron offers easy clean up. Hint here– I’m offering options for both the splurge and the bargain, but I totally recommend going with the bargain in this case. I use a Lodge cast iron, and I love it. It’s very affordable. While the enamel does make for easier cleanup, I generally use my Scanpan nonstick pan when cooking something that might stick (though a well-seasoned cast iron will prevent sticking just as well). Enameled cast-iron pots are great in that they have the same helpful properties as a cast iron skillet. 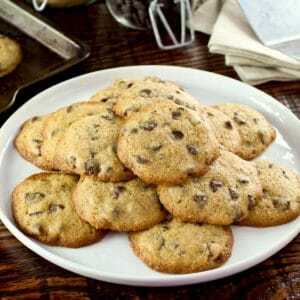 They are quite heavy and deep, usually round or oval in shape and come with two handles and a lid. These styles of pots, also called dutch ovens, are great for cooking hearty meals with a lot of ingredients, like stews, roasts and ragus (think Julia Child’s famous boeuf bourguignon). They are also useful for braising and simmering. The enameled finish helps with easy clean up. Double boilers are helpful when preparing foods that cannot be held over direct heat. They consist of a 2 parts, a bottom pot that holds water and an upper pot that rests inside, over the steam and away from direct heat. When the water in the bottom pot begins to simmer or boil, the steam rises and heats the upper pot. Double boilers are key in warming delicate foods like melting chocolate and making candy. 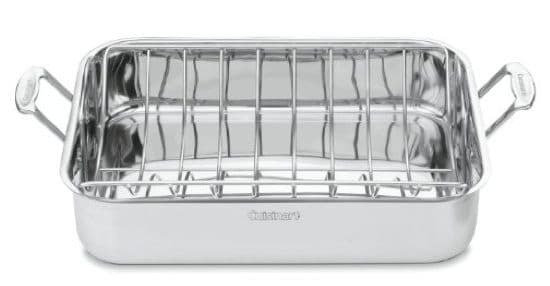 Roasting pans are deep rectangular pans used mostly for roasting meat and poultry. 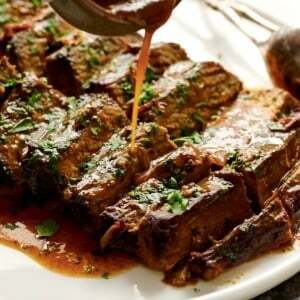 Many are available with a removable rack, which helps to separate fat drippings from the meat. This is a basic overview of stovetop cookware, however there are many other specialty pots and pans out there. Bakeware is another category that can be perplexing– I’ll deal with that in a future post. 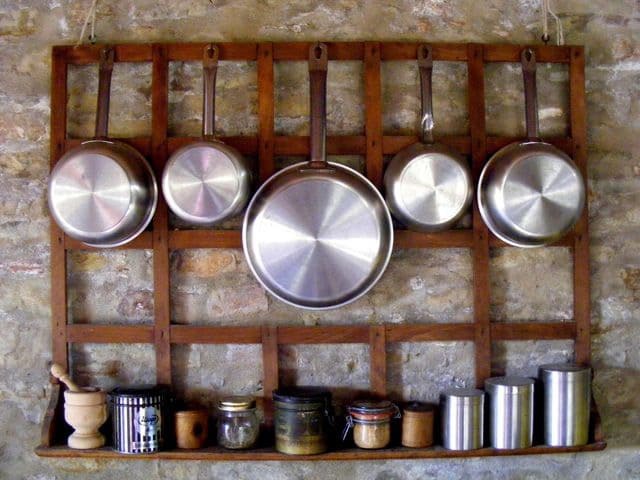 The stovetop pots and pans listed above are the most common and most useful. They’re the ones I rely on most in my kitchen. I hope this list will help take some of the stress out of choosing the right cookware for your own kitchen! I just had a Thermador gas cooktop installed, but it does not have the simmer option. When I cook tomato sauce, it always scorches, burns, bubbles and splatters, even on the smallest star burner at the lowest setting. I use a stainless steel stockpot – 18/8 , but it was not overly expensive, maybe $75. I am wondering if a heavier stainless steel, such as All Clad, would solve these cooking issues? Hi Liz, Tori’s assistant Ashley here. My guess is that the heat is either too high or that the pan you are using is too thin. Unfortunately I don’t have any experience with this cooktop, so I can’t say for sure what is going wrong here. This really helpful for everyone, and the way you explain its awesome. What type of cookware would you recommend for a nearly 30-year-old Thermador gas stove that seems unable to get very hot or, conversely, achieve a very low simmer? I’ve tried All-Clad pans but the food doesn’t brown well. Hi Chris, if your oven doesn’t get very hot it will be very difficult to brown foods well, no matter which pans you buy. Copper core tends to transfer heat the best, but if you’re having trouble getting a good browning with All Clad I’m not really sure what would work better. You could try a thinner, lighter pan, perhaps? I bought a All Clad 10 piece on sale and two extra d5 with no stick coating. The no stick coating one was returned for replacement. The second one is going to be replace. The finish became well “returnable”. The stainless steel All Clad is a gem. Coconut oil its non stick. All the cleaners you suggest but simple sponge abrasive pad or non steel wool pad is okay. Love the set now problems in the oven/broiler/stove top/barbecue. You pay for what you get. Plus they gave me several gifts like Oven Mitts, Dutch Oven. It is a set for life. I just purchased the All-Clad 12″ stainless steel skillet from Amazon for $119. I’ve seen it recommended on many sites as well as at the online cooking school I’m currently taking courses in. They claim it’s the best one because of a variety of reasons, but mostly because of the browning that occurs as well as the quality of the pan. I’m looking forward to using it and with my previous knowledge of how much food stick to stainless steel, I’ve got my fingers crossed. Thanks for the great post! Can I use my induction cookware on electric stove coils without any problem. Will cooking time be about the same? Moving and don’t want to have to buy another set of pots/pans for the electric stove there. Thank you. Please respond to my email address. Hi Gerald– that is so strange! I have never had this issue. I can only think it has to do with the natural gas, since it is on the outside of the pan. You might try cast iron for frying, at least it won’t show! I have a scanpan roaster, can this be used on my gas stovetop before going beneath my grill which is in my oven? Hi Brenda, I have Scanpan frying pans but not the roaster. I would assume the roaster will probably be fine on the stovetop, however you might want to double check with Scanpan headquarters to make sure. I agree with Tori’s comment concerning sets of cookware. There are a lot of sets that do not include boilers small enough for a few eggs to boil, or for heating a can of beans, corn, etc. So I tend to buy boiler piece by piece when thinking about the amounts I have to cook for certain meals. I like cooking but am having difficulties with sweets on a Glass flat top Electric Stove. It seems I Can’t get sugar and syrup up to 300-deg, which is what I have to reach for Peanut Brittle. I have no problems on the neighbors Gas stove. What kind of cookware Should I use for this on this Stove? Hi Keith, I would go with cast aluminum pans, stainless steel or cast iron on a flat top electric stove. Make sure the pan bottoms ar every flat. Pans vary in terms of heat conductivity, so you may need to try one from the set you’re thinking about before buying the whole set. This is a very informative article. I love my cast iron skillets and dutch oven, but find that they really scratch my new ceramic top stove. I do have a corning skillet that I love, but I have to watch the heat, as it burns easily. Even though I have some old Magnalite that I still use for making candies, I would prefer the stainless for cooking veggies and rice. Hey Tori, nice blog you have here. I enjoy cooking and it is fast becoming my second best hobby. i do most of my cooking using stainless steel and cast iron cookware. Hi Ada, I am not always a fan of the full sets, as you’ll read above– I tend to buy the best pan for my needs regardless of brand. 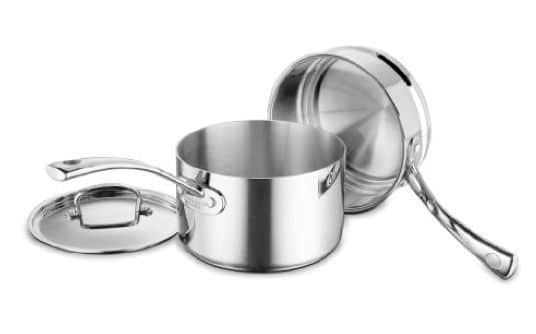 However, if you’re looking for one brand as a set, my recommendation would probably be All Clad. It’s the most recommended by chefs, however it does require some special care, so be sure to read the instructions that come with it. 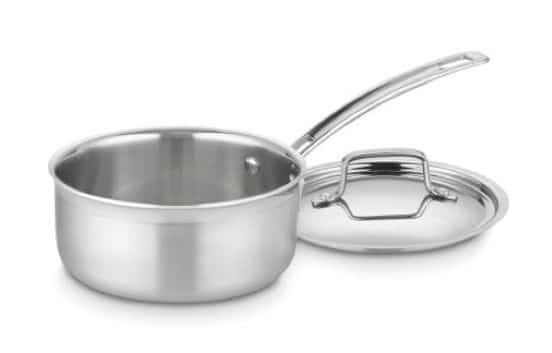 Also All Clad pans are expensive and tend to be slightly heavy, so if those are concerns you may want to go with another brand like Cuisinart, which is also high quality but less expensive and less heavy. Stainless steel is easy to clean if you’re using it properly with the right amount of heat, and you are greasing it when needed. I would also recommend getting a PFOA-free nonstick skillet for sautéing stickier items like eggs. The most important part is to read the literature that comes with your pans and take proper care of them; they’ll last a lifetime if you are careful. Also, be sure to buy some Bar Keeper’s Friend, which will help you clean the more stubborn stains. Good luck! is there a device that can be put on the burner of an induction stovetop so you don’t have to get the special pots and pans? Not that I’m aware of Kaye! Maybe another reader will have a suggestion? Hi and thank you for the answer–where and which brand “hot plate” do you recommend…….the glass top makes me so nervous. And someday my hands shake and my grip is not what it used to be so I am always worried even with what I am using. Thank you, I know you are busy………love your site. Lauren, I searched online for the induction unit that offered the highest wattage at a reasonable price. Mine is made by BergHOFF. The glass top on your induction cook stove should be very durable. I hope you will use your cast iron on it, and any stainless steel cookware that a magnet (refrigerator magnet will work) will adhere to. I really do like the quickness and efficiency of induction. I have three real cast iron pieces. Two of which were my grandmother’s and mothers and now thank goodness for last 20 years mine. That being said……we now rent and can no longer own…..the darn stove is an induction, glass top. I am terrified to use my beloved pieces……ANY suggestions…..I have never had this problem and do not know what to do. I only have had by choice gas top stoves. Thank you so much for your wonderful site……love your foods !!! Lauren, you’re so fortunate to have the induction stove….the cast iron pans and stainless are the only kind which will work on that kind of cooking surface!! While I know the grass always looks greener on the other side of the fence, I have a fairly high end gas cookstove, but the btu output on 2 of the burners is only 6,000 each!! Impossible to boil water!! So….I found an induction “hot plate” which I use for lots of my cooking…. get those cast iron pans on the induction!! I love to cook, and I am lucky I have a rather large kitchen, even that being said, I have room issues keeping everything sorted out, never enough room in the cabinets. I fancy cast iron (most of my cast iron are antiques, many from the 1800’s) for the greatest portion of my cooking, I have enameled stock and stew pots and some large stainless soup pots, I have a really nice old porcelain covered cast iron muffin pan that makes muffins to die for! I have some Magnalite pans for acidic foods, and non-stick stuff for pasta sauces, and a variety of baking dishes, mostly Pyrex, and a few porcelain covered roasting pans. I once had some copper bottom pans in the past, but I really did not care for them much, they do not do so well on electric stoves which are what most people in Florida have to cook on. Like you said in your article it really depends on the cook and what the cook has available ( i.e. your primary heat source). Cast iron is the most useful, and of course very heavy, yet easy to care for if one avoids using any kind of soap on them. I really appreciated this very fine article, thanks again Tori for your wonderful website !!!! Though you list the Le Creuset Enameled Cast Iron Skillet as the splurge, the enamel you pay an extra $120 for is simply window dressing. It’s not enameled on the cook surface, so it makes for an expensive window dressing. Lodge and Le Creuset cast iron is almost identical. Since both enamel processes are done in China these days, the enamel you are paying for is even more of a waste for cooks. 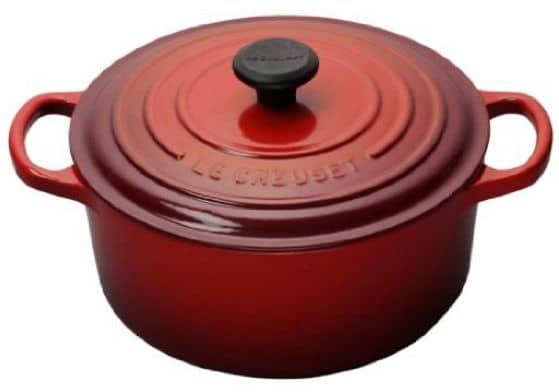 I would suggest buying 4 Lodge skillets of varying sizes, that can become heirlooms (I cook on a piece a that is over 100 years old and never seen soap) for what a robin’s egg Le Creuset would cost. Plus with a non-enamel bottomed skillet, you can cook directly on a wood fire. I think those reasons alone would pull an enamel bottomed cast iron skillet out of my plans. This has become a workhorse camping, at home and in the restaurant. Hands down the most versatile piece of cast iron I own (which is a ton) because of it’s generous size. Agreed, though some enameled cast iron skillets are enameled on the cook surface (I have a small one at home, which makes for slightly easier cleanup). That said, a well-seasoned cast iron will work every bit as well, and it’s much more affordable.